The relationship we have with ourself has the greatest influence on our wellbeing at work. There's also a direct correlation between the wellbeing of staff and the wellbeing of pupils. 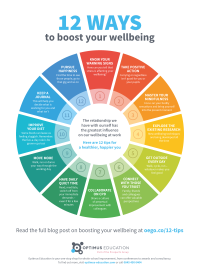 To demonstrate your school's commitment to supporting a healthy work-life balance, download and share these 12 tips for staff wellbeing.